Do you remember the background masterboards I made as my first outing using the new Distress Oxides (here if you missed it) and then the two cards I made using some of it? (Again here and here if you missed those too). But waste not, want not I wasn't going to let the pieces left over go into the bit box yet and I needed a couple of cards to send to to lovely friends who had sent me happy parcels in the post, so I put them to good use. I'm using these as my project for the Country View Crafts project blog today, so please pop over there to see more details and photos. Two beautful cards - this is such an artsy watercolour look with this Oxides - but I guess this is just you and your skills that make them looking so artsy! Schmetterlinge sind wie Küsse im Sommer. Beautiful cards. We crafters cannot waste anything and it shows in these fabulous backgrounds. Wow, Brenda! I love these cards and the backgrounds you created using the oxides. I just picked up a couple of colors and am anxious to give them a try. Thanks for sharing the original post on the background. Two lovely cards, Brenda! Very pretty! Brenda, you are the poster child for Oxides! No one gets the beautiful backgrounds from these inky squares like you do! 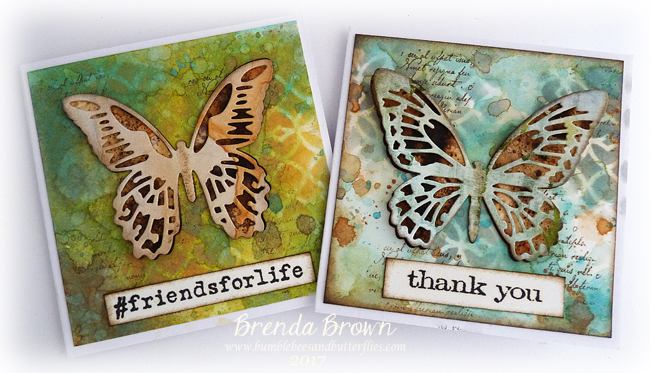 Adding stenciling, stamping and those awesome butterflies yielded two very lovely cards! I know the recipients were so pleased! Hugs! Dear Brenda, these are just gorgeous!! I so love your work with those Oxides!! Did you see new colors are on the release?? Yay! Yummy Oxide backgrounds - especially love the one on the right - a perfect way to say thank you.